Tech stocks are having a rough quarter. Since the start of the fourth quarter, the technology sector has shed about 14% of its value, leading the broad market lower as the very same stocks that fueled most of the S&P 500's gains for the last year and change suddenly became laggards. Semiconductor stock Advanced Micro Devices (AMD - Get Report) hasn't been immune from that selling. In fact, AMD has sold off twice as hard as the rest of the tech sector, shedding 35% of its market value since the calendar flipped to October. Lots of eyes are on AMD right now, and for good reason. This $20 billion chipmaker has been one of the best performers in the S&P 500 in recent years, and it's been a bellwether for investors' confidence in the tech sector. After taking a significant haircut in the last month and change, AMD's price action is starting to look interesting - and with big implications for the rest of the tech sector. To figure out how to trade it, we're turning to the chart for a technical look. At a glance, it's hard to miss the sharp, gappy correction that kicked off at the beginning of October. But zoom out a bit, and things look less bleak. Context remains critical when weighing the correction in the equity market this quarter. Yes, AMD is down 35% since the start of October. But that statistic only tells a tiny part of the story - it leaves out the fact that AMD is still up 77.5% in the trailing 12 months as of this writing. Big rallies beget big corrections. That's a normal part of the market's lifecycle. And right now, it's looking a little premature to call AMD's uptrend dead. That's because shares of AMD managed to correct this time around to the same trendline support level that they established back in April, during their previous correction. We've now seen shares catch a strong bid at that trend line twice in the last month, signaling that buyers remain willing to step in and pull the trigger at lower levels. 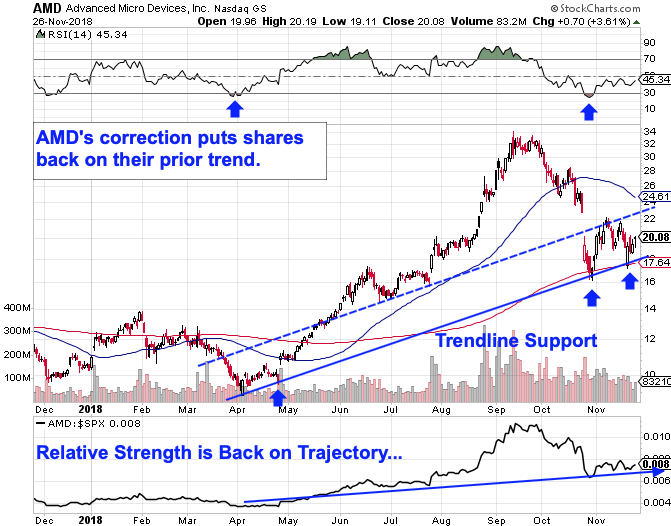 Between that and the fact that price momentum re-touched the 30-level on the 14-day RSI (the same level that acted like a floor back in April), there's mounting evidence that what we're seeing here in AMD is a return to its prior uptrend after getting overheated, not a signal that the upside is over. With the uptrend back on track, now looks like as good a time as any to build a position in AMD. That's in part because shares just showed us a support bounce, and in part because if AMD does end up violating its support level, it won't take long to find out you're wrong. Risk management remains key in this market - don't buy any stock without an exit plan. Meanwhile, in the long term, AMD is finally showing signs of life this fall.